As comfortable and familiar as an old friend. At home in your hands. A deep grip design and balanced weight feel great with both Nikkor Z and F-Mount Nikkor lenses with the Mount Adapter FTZ. Buttons and dials are comfortably placed—features like the sub-selector and AF-On button are in the same position as the D850. Unmistakably Nikon. One of the major benefits of the Z 6’s thin 16mm flange back distance is that cameras can be made smaller and lighter. The Z 6 is smaller and lighter than the D750, yet it maintains outstanding handling and balance, even when using telephoto F-Mount Nikkor lenses. It’s as comfortable to carry as it is to shoot with. The next generation of NIKKOR glass. Greater performance from the lenses you love. When used with the optional Mount Adapter FTZ, more than 90 F-Mount Nikkor lenses maintain all of their sharpness, resolving power and functionality and gain the advantages of the Z 6’s in-body VR, silent shooting, PDAF focusing system1, 4K video and more. Approximately 360 F-Mount Nikkor lenses can be used. Compatibility as only Nikon can deliver. 2732 on-sensor AF points cover 90% of the frame (approx.) horizontally and vertically. Subjects are acquired quickly when they enter the frame and tracked throughout the frame, even to the far edges. Using an AF algorithm optimized for its FX-format sensor, Z 6 automatically switches between focal-plane phase-detect AF and contrast-detect AF to fine-tune focus. The light-shielding phase detection pixels are carefully arranged on the sensor to preserve light, ensuring accurate AF even in dim lighting. Powerful in-body 5-axis VR image stabilization is applied to whatever Nikkor Z lens you’re using. Up to five stops3 of image stabilization in up to five directions—yaw, pitch, roll, X and Y. During video recording, optical VR is combined with electronic VR (e-VR) for even steadier shots. Normal VR mode for static subjects. Sports VR for moving subjects. For the first time, F-Mount Nikkor lenses like the AF-S Nikkor 105mm f/1.4E ED or AF-S Nikkor 14-24mm f/2.8G ED can benefit from in-body 3-axis VR4. Nikkor lenses that already have VR, like the AF-S Nikkor 70-200mm f/2.8E FL ED VR, get the added benefit of roll axis for a total of 3-axis VR. Just add the optional Mount Adapter FTZ and you’re good to go. Capture cinematic 16:9 4K UHD/30p video in full-frame using the total width and resolution of the Z 6’s backside-illuminated sensor. Full-pixel readout for sharper 4K footage with rich information equivalent to 6K. Clean output at high ISO. Zero crop factor with full-frame Nikkor Z and F-Mount Nikkor lenses. Focus Peaking in both 4K and 1080p recording. Simultaneous 8MP stills5. This is 4K as it was meant to be. Shoot up to 9,999 full resolution stills using Interval Timer (and zero shutter vibration), then combine them into one 4K movie with 3rd party software. Or create time-lapse sequences right in the camera with exposure smoothing and extended low-light metering range—great for star trails and light painting. All of your Z 6 footage can be time-coded in-camera for easier synchronizing and logging, especially when editing shots from multi-camera shoots. The speed, smoothness and accuracy of the Z 6’s AF system is ideal for video. It’s virtually silent, very little chance it will be picked up by an external mic. When used with Nikkor Z lenses, "breathing" and "wobbling" are all but eliminated. You can even touch to focus using the LCD for fast transitions between subjects. 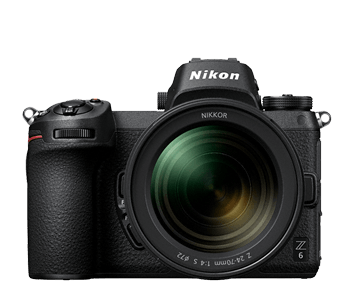 17% larger internal diameter than Nikon’s acclaimed F Mount. Wider than any full-frame mount available<sup>6</sup>. It totally changes what’s possible with lens design. Enhanced low-light performance. Even illumination from corner-to-corner. Maximum apertures as wide as f/0.95. Faster data transfer between camera and lens. This is the ideal balance between mount diameter, large image sensor and flange focal distance. Connections? It’s got a few. Transfer images to compatible smart devices 2X faster than previously possible—up to 25 mbps. Choose between the 5 GHz and 2.4 GHz bands for optimum transfer speeds7. The Z 6 can automatically connect whenever your compatible smart device is in range. Send original resolution JPEGs or have the camera automatically transfer 2MB versions of your photos as you shoot them. For the first time in a full-frame Nikon camera, you can charge the Z 6’s new EN-EL15b battery in the camera through a standard USB-C connection—from your computer, a wall outlet or other charging device8. Already have EN-EL15a/EN-EL15 batteries9? They work with the Z 6, too. Connect to a Mac or PC over Wi-Fi and wirelessly transfer RAW, JPEG and movie files. Two modes available: Camera Access Point mode, for connecting directly to a PC, and Station (STA) mode, for connecting over a router10. Nikon takes touchscreen control to the next level. Touch to focus. Pinch to zoom. Touch to fire the shutter. Swipe through photos and videos. Navigate settings as easily as navigating a smartphone. Pinch to magnify the image on-screen to check for critical sharpness. We’re living in a touchscreen world, and this is a touchscreen camera. Totally familiar for a Nikon DSLR shooter, fast and intuitive for someone new to the Nikon system. Z 6’s menus and user interface are elegant, clear and easy to navigate with touch control. Easily add your favorite functions to the (i) menu—over 30 settings available—then access them from the LCD or EVF. 1 Full AF/AE supported when using FX or DX AF-S Type G/D/E, AF-P type G/E, AF-I type D and AF-S / AF-I Teleconverters. 2 231 on-sensor PDAF points used for video In FX-based movie format with single-point AF. 3 Based on CIPA Standards. This value is achieved when the Nikkor Z 24-70mm f/4 S lens is attached, with zoom set at the maximum telephoto position. 4 Requires use of the Mount Adapter FTZ. 7 May not be available in certain countries. 8 Requires optional EH-7P Charging AC Adapter. Camera cannot be used while charging via USB. 9 EN-EL15a/EN-EL15 batteries cannot be charged in the camera via USB. 10 Wireless Transmitter Utility software must be installed on the computer.